Hit the play button to check out the latest single release of sunshine artist Turtuga Blanku. Attention! All music you hear on this website is recorded environmentally friendly, with solar power, in Turtuga Blanku's Green Machine. Who wins? 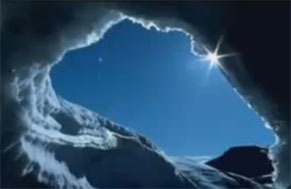 Listen to my Rap Battle of Nature: North Pole vs South Pole. Beware, this could happen to you, too...! The music of this new lyric video was recorded using only Caribbean solar power. Check out Your Daddy. Earlier, I interviewed the sound designer of the film ‘The Corporation’ Velcrow Ripper for the 5Q-interview series. This film being an important source of inspiration for the song No More, I am very happy to now present the 5Q-interview with Joel Bakan. He is the writer and filmmaker of the book and film ‘The Corporation’. Joel also happens to be a musician; co-producing and playing in the band of his actress/singer wife Rebecca Jenkins. Bakan: "Then act, and keep acting, forever"
Check it out. Just press the play button in the player. iPad users, and other platform-users that do not support Flash, please click on the Soundcloud play button underneath. If you want to support my quest to popularize renewable energy, please let people know about my website and/or buy this solar powered song through BandCamp: Your Daddy on BandCamp. (It costs less than one cup of coffee, but lasts a lot longer!). I am involved in a very attractive public awareness campaign about climate change, set up by Tremendous Light. Please watch this 44 seconds animation called FishBones for which I provided the music. 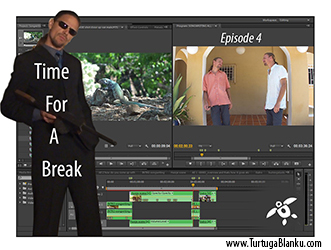 The fifth episode in my series Time For A Break is out. I've got a new solar powered tune soon to be released. This one is for the ladies...a specific kind of ladies, though. You'll see what I mean. A new episode of Time For A Break is on the way. This time it will be about the solar studio in which recorded the songs that you can hear on my website. Friends! Old chums.. members of my extended (borgata) famia.. friends of friends.. vague acquaintances.. business partners.. You'd better check out my brand new official music video of Señorita Bunita. (No pressure.. just want you to know that I have a tommygun, as you can see in the music video...). My song is now also on the playlist of Vibe Radio MW, an online radio station from Malawi, Africa. 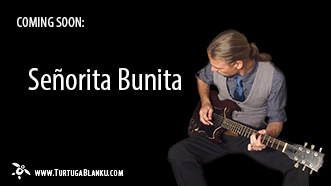 Not only that, Señorita Bunita is selected to be 'Song of the Week' as well. Broaden your horizon and check out Vibe Radio Malawi. Señorita Bunita was played on 'The Independent Share Radio'. It is broadcast through a completely off the grid and all solar and wind powered web host. Only $1 to possess my Señorita Bunita for as long as you like. Just step into my BandCamp-office. 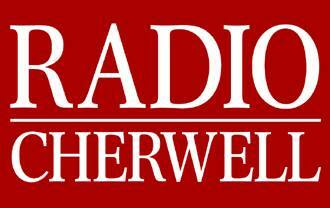 My song All The Same was played on the 'Going Wild with Wildlife' on Radio Cherwell, part of Oxfords Hospitals' Broadcasting Association. Thanks a lot for your contineous support, Stuart Mabbutt! Radio station Voz Di Bonaire has added my latest song Señorita Bunita to their playlist. Masha danki for the airplay, Feliciano! The fourth badass episode in my series Time For A Break is out. I wanted to let you know that I'm a gangsta now. As you can see, I am armed and considered dangerously smooth. I expect to be spending a lot more time with teh señoritas, so I might not be able to make it to our bowling-evening next week. She's here. Just press the play button in the player. iPad users, and other platform-users that do not support Flash, please click on the Soundcloud play button underneath. If you want to support my quest to popularize renewable energy, please let people know about my website and/or buy this solar powered song through BandCamp: Señorita Bunita on BandCamp. (It costs less than one cup of coffee, but lasts a lot longer!). Here is the third episode in my new series Time For A Break. Strange things are happening outside my solar powered music studio. Or are there..? Check it out! Please enjoy the lyric video of the new Turtuga Blanku song All The Same. It's here. Just press the play button in the player. iPad users, please click on the Soundcloud play button underneath. 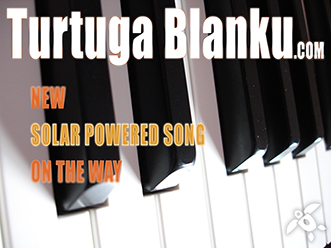 If you like what you hear and want to support Turtuga Blanku's solar powered music, you can buy this tune (and others) through the shop-page. I was chosen to be the very first 'Ecocitizen of the Month' by Ecocity Builders. Find out more here: http://tinyurl.com/q7uzlm8 (scroll down a bit). Or simply read the article underneath. 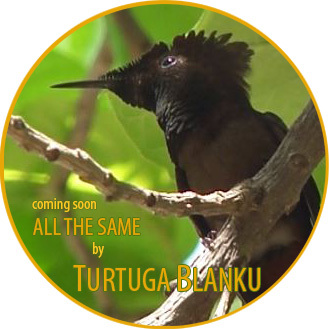 Here is a sneak-preview of the new Turtuga Blanku song All The Same soon to be released! 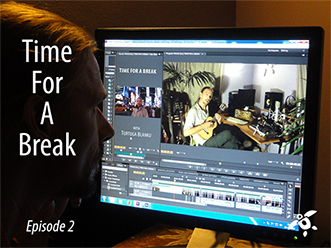 The second episode in my new series Time For A Break is out! There is a mysterious sound around my solar powered music studio. Find out where it is coming from. Time For A Break: second episode soon! Episode 2 of my new series Time For A Break will be out soon. I'm just working on some finishing touches. And then you will be able to watch yet another Caribbean adventure taking place in and around my solar studio. The first episode can be seen here: Time For A Break: Iguana. Clean Technica is endorsing my latest song Get Out and my new youtube series Time For A breakon their website. Time For A Break: First Episode! Life of a musician in the studio is a lot of blood, sweat and tears...well..mostly sweat, actually. Anyway, every now and then, I need a break. And you, sitting behind your desk, are entitled to one, too. (Look it up, it's in your Collective Labour Agreement). I only have to get up and take a look out of the windows of my tropical recording studio to get some relaxation. In Time For A Break you -too- can see what's going on in and outside my solar studio in the Caribbean. Check out the very first episode called Iguana. My new solar powered song Get Out is now available through BandCamp as well. 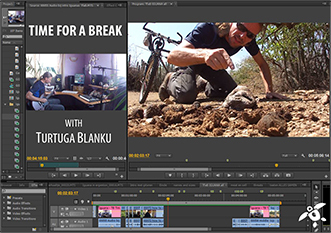 I am working on a new youtube series called Time For A Break. When I am busy in my solar studio and in need of a break, I only have to look outside the windows of the Green Machine to find some entertainment. The first episode 'Iguana' will soon officially be released, so that you can check out the things that happen in and around a solar studio in the Caribbean as well! The player on my homepage is Flash-based and iPads do not support Flash. There is also this work-around: How-To-Play-Flash-On-The-iPad.htm. Click on the image to go to the lyric-page of Get Out. Alan Weisman is Laureate Associate Professor in Journalism and Latin American Studies and author of the book 'The World Without Us'. 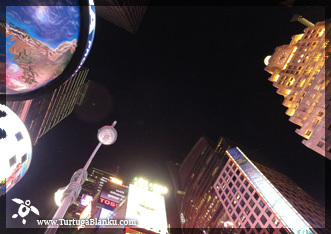 Weisman: "Reduce the number of people on earth"
When visiting New York City the music video of Turtuga Blanku's I See Stars was shot. It was pretty cold, but Times Square is a well suited location to go with the lyrics of I See Stars. 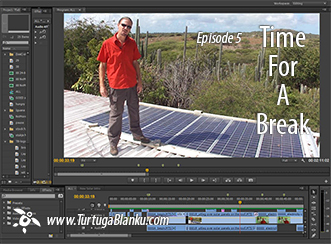 All editting and post-production took place in the warm, sunny Caribbean, using only solar power. This video is available in up to 1080p HD, so please use the Youtube 'change quality'-button to select the settings of your choice, to watch in higher quality. I was invited by Sean Paton to step by the radio station ´MegaHitFM´ to promote a couple of my songs during his radio show. The Turtuga Blanku songs I See Stars, Golden Bubble and No More were played and we had a nice conversation about my solar-music, solar-studio and sustainability. The new song I See Stars is now available for a listen. Press play on the homepage. You can also listen to I See Stars on SoundCloud: Turtuga Blanku on SoundCloud. If you like what you hear and want to support Turtuga Blanku's solar power music, you can buy this tune (and others) through the shop-page or at BandCamp. A music video of I see Stars will soon be released on youtube as well. I was contacted by a Japanese blog-writer who had written a blog entry about my music: Ecological Music searched by Japanese Cat. She also directed me to an article on a Japanese eco-website. 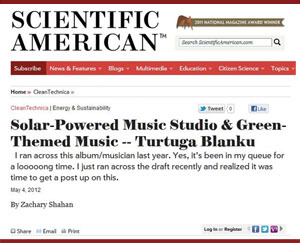 Turtuga Blanku on the Scientific American website, read more here. Radiostation 'MegaFM' gave Keep On Dreaming some airplay. It's there... The full animated music video of Turtuga Blanku's No More can now be viewed on YouTube! Additionally, the song Golden Bubble got some nice airplay on both BonFM and MegaFM. No More is now available for a listen. Press play on the homepage. You can download No More for free by right-click 'save link as' on this link: TurtugaBlanku_NoMore.mp3. You can also download No More on SoundCloud: Turtuga Blanku on SoundCloud. Feel free to share No More with your friends, family or colleagues. 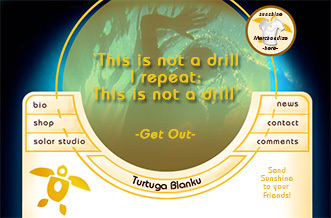 If you like what you hear and want to support Turtuga Blanku, you can buy this tune (and others) through the shop-page. Global Dimming, a (BBC Horizon) documentary by Dr. David Sington. 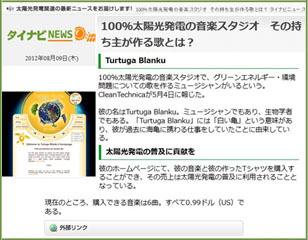 Get your own Turtuga Blanku banner here.